BOSTON - Wednesday, November 14, 2018 ­- Mayor Martin J. Walsh today announced that Phase Two of the Orient Heights redevelopment in East Boston has officially begun, a $51.6 million investment that is part of a larger effort to transform the 331-unit public housing development, originally built in 1951. The Boston Housing Authority (BHA), the Department of Housing and Community Development (DHCD), and the developers of Trinity Financial and East Boston Community Development Corp., last week began rebuilding 88 units at the site. Following the successful completion of Phase One, a $51.2 million investment which created 120 units of new affordable rental housing, Phase Two will leverage $10 million in proceeds from the sale of the Winthrop Square Garage, as well as $1.83 million in Inclusionary Development Policy Funds, secured from the Davis Companies' 99 Sumner Street development in East Boston. "Today we celebrate another significant milestone in the revitalization of Orient Heights," said Mayor Walsh. "This effort will continue to improve the lives of our residents, while creating a community that more appropriately fits in with the surrounding neighborhood." Phase One of the project, which was completed in the spring of 2018, consisted of the demolition of 90 existing public housing units and the construction of 120 units in a combination of townhouse and mid rise buildings. The units are spread across four town homes containing 32 units and one mid-rise building containing 88 units and on-site property management offices. All 120 units will receive an operating subsidy - 75 percent of the units will receive state public housing operating subsidy and 25 percent of the units will receive project-based subsidy through the Massachusetts Rental Voucher Program. The Phase One project achieved Leadership in Energy and Environmental Design (LEED) Platinum certification. Phase Two will include the demolition of 87 existing units in four buildings and the construction of 88 replacement state-funded public housing units in two townhouse buildings and one mid rise building. The redevelopment will also include improvements to the existing infrastructure and open spaces, and is anticipated to be completed in 2020. "It is amazing to see the changes in our community since the completion of Phase One," said resident Carol Johnson. "The residents of Orient Heights are pleased and enthusiastic about what is to follow with Phase Two." The Orient Heights public housing development is owned and managed by the BHA, which undertook a planning process in 2008, funded by DHCD, to consider redevelopment options for the site. The BHA commissioned a master plan with an overall design concept and established the goals for the site's redevelopment-to transform the site into an attractive, energy-efficient and healthy housing community modeled on the successful transformations of previous public housing redevelopment efforts at sites such as West Broadway, Maverick, and Old Colony. In January 2015, the BHA selected the development team of Trinity Financial and East Boston Community Development Corp. to work with BHA and DHCD and finalize a redevelopment strategy for the site. This development team will secure financing to implement the redevelopment, and will own and manage the buildings post-redevelopment. The BHA will continue to own the land and will lease it to Trinity. "We look forward to continuing our work with Trinity Financial, our development partners, to revitalize the Orient Heights public housing community," said BHA Administrator Bill McGonagle. The total development cost for Orient Heights Phase Two will be approximately $51.6 million. The financing plan includes $19.4 million in private equity raised through an allocation of federal 4 percent Low-Income Housing Tax Credits; tax-exempt bonds for construction financing; $16.75 million in state public housing capital funds from BHA and DHCD; and $11.8M affordable housing resources from the City of Boston. DHCD also provided $32.7 million in state public housing capital funds for Orient Heights Phase One. "We are proud to support this transformational project that will benefit the residents of Orient Heights and the larger East Boston neighborhood, with our largest capital commitment ever of nearly $50 million for a state-aided public housing development," said Housing and Community Development Undersecretary Janelle Chan. "I want to recognize Boston Housing Authority's creative leadership, Trinity's partnership, and the City of Boston's unprecedented commitment of funds to make this project work." BHA and the development team continue to hold meetings with residents and the neighborhood, meetings with the Resident Task Force and various meetings with City and State officials. BHA, Trinity, and the East Boston Community Development Corp. will continue to meet with the residents and the broader neighborhood on an on-going basis throughout the project's stages. Current Phase Two residents of the site worked with a relocation team regarding which relocation options best meet their needs. 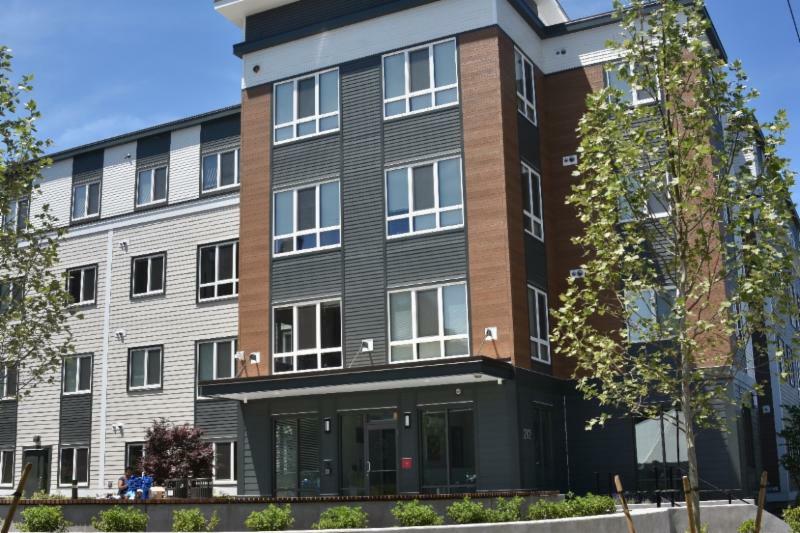 Relocation options included moving to another BHA public housing development of their choice or moving to privately-owned housing with a state-subsidized Massachusetts Rental Voucher Program (MRVP). Residents may choose to return to the redeveloped site when construction is complete or remain in place after initial relocation. The Boston Housing Authority (BHA) is a public agency that provides subsidized housing to low and moderate income individuals and families. In addition to conventional public housing communities throughout Boston, BHA offers rental assistance programs. BHA receives federal and state funding in order to provide housing programs to individuals and families. BHA's mission is to provide stable, quality affordable housing for low and moderate income persons; to deliver these services with integrity and mutual accountability; and to create living environments which serve as catalysts for the transformation from dependency to economic self-sufficiency.